You must have read that Lenovo of China has sped past HP to become the world's largest PC maker. 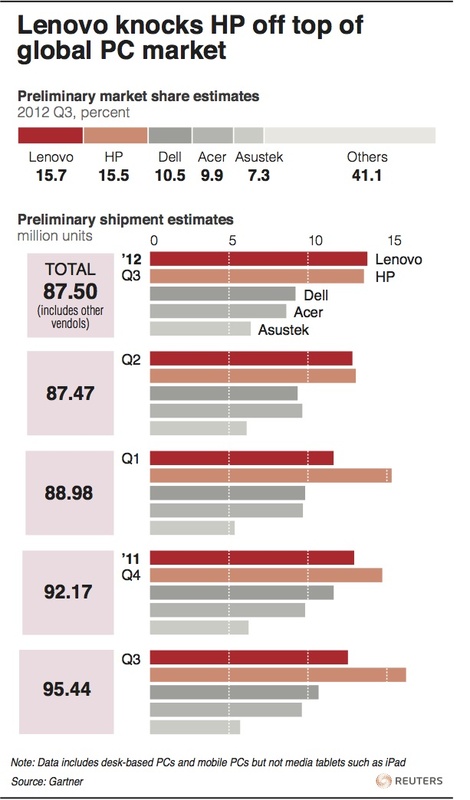 This Reuters graphic gives a lowdown on the top 5 PC makers. One more reason why I hate Nehru-Gandhi bastion, only this time it is that hatred is towards the topmost person in the family. Man, it's as if he has ruined China for India. No wonder Maxwell's book was strongly opposed by bhajanlals, no wonder henderson's report is not made public. I've got one more reason to respect the unsung hero, P V Narasimha Rao, appreciate his intentions to open negotiations over the boundary disputes. Hope Indian government will someday take a leaf out of his book and settle the disputes.